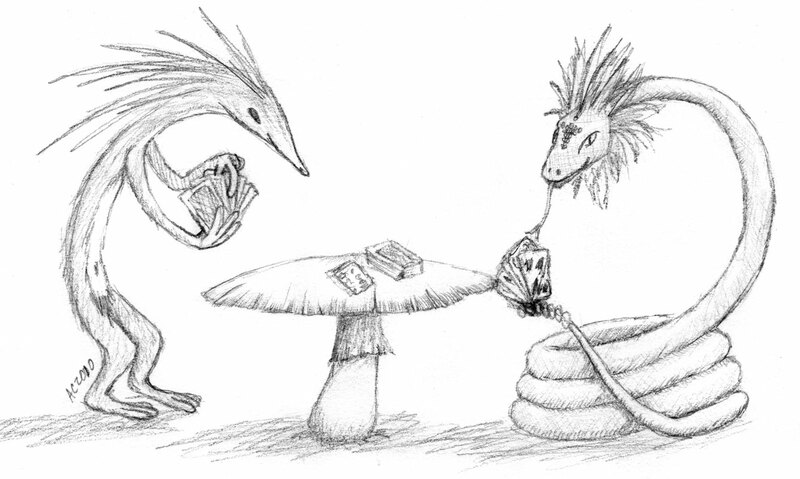 I feel as though this should be renamed “Myths Playing Poker,” except neither one is really a specific mythical creature. I’m thinking of doing this up as a watercolor, but we’ll see how much motivation actually occurs. I do have another watercolor to work on, though, so it’s got a chance. Edit: Got the watercolor done, you can see it here. I drew this the other day when I was at a cafe with a friend, it was nice to have nothing else to do, because it encouraged me to make the piece much more finished and add a lot of detail rather than just doodle up a quick sketch.